There is no way to overstate that 44Clash is one of the coolest yoyo contests to ever exist. No matter how cool you might think it is, it's actually cooler than that in person. There is no way to overstate that 44Clash is one of the coolest yoyo contests to ever exist. No matter how cool you might think it is, it’s actually cooler than that in person. the goal of this exhibition is not to find winners or losers, but rather for freestyle development and criticism. with the prizes in place, we hope to see competitors try their best to perform at their highest capabilities. It’s great to see alternate contest formats getting some play, and hopefully we’ll see plenty more of this type of contest in the future. UNPRLD had cash prizes for First and Second place, and a prize bag for Third. Check out video of all the winners, and congrats to Mark Mangarin on his win! The 2019 Pacific Northwest Regionals was another amazing event, once again setting the tone for the US contest season to come. Check out full results and videos of the winners in all divisions. The 2019 contest season is in full swing around the world, and as usual all eyes are on Japan to see who will be advancing to Japan Nationals and finally to the 2019 World YoYo Contest. Check out full results from the Central Japan Regionals, along with video of the winners! Congratulations to all the winners at the 2018 French National YoYo Contest! Check out the full results from the event, plus video of the winners. Check out full results from the 2018 MA State YoYo Contest, and video of the top three freestyles from the 1A Division. Congratulations to all the winners of one of the largest state contests in the country! The International YoYo Federation announced some organizational changes to the way the World YoYo Contest will be handled moving forward. At this year’s IYYF meeting in Shanghai, and after discussion from board members, a few key changes were agreed upon to help streamline the organizing process. WYYC2020 will be held in Budapest, Hungary. WYYC2021 will be in Japan. IYYF is proud to introduce the host countries of the 2020 & 2021 World Yo-Yo Contests. WYYC2020 will be held in Budapest, Hungary, and WYYC2021 will be held in Japan. Further details will be announced when they have been confirmed. Keep your eye on www.iyyf.org for news. We have had many discussions among the IYYF board on how to decide the location and team for running WYYC. Each year there are many exciting location options, yet at the same time there are many challenges and difficulties that come with running the contest in a different place every time. Learning from our experiences over the course of the past five years organizing WYYC, we decided to reevaluate our situation and have, as a result, revised our decision plan. Here are some changes about how the WYYC location will be chosen in the future. 1. We will no longer be bound to the three-year cycle of Americas, Europe and Asia. 2. We are no longer accepting proposal documents for new locations in the same way that we have in the past. 3. If you are interested in running WYYC in your country, please contact us so we can discuss the possibilities; we will also ask serious applicants to join the current WYYC organizing team as a core member. This way, the IYYF team can better share its knowledge, resources, and get to know new members through working together with them. New members will be able to learn more from current organizers and work alongside them to help run WYYC. Essentially, instead of asking other people to struggle and come up with ideas by themselves, we have decided to welcome more people so we can diversify our team and work closely together for future contests. In the long run, we hope to better ensure stability, consistency, and increase the quality of the event year to year. Thank you, as always, for your participation in the World Yo-Yo Contest. None of this would be possible without your involvement and support. We look forward to being able to bring WYYC to even more places around the globe, and we hope you’ll join us on that journey! There has already been some confusion over some of these points, so let’s go through them for some clarification. We will no longer be bound to the three-year cycle of Americas, Europe and Asia. This does not mean the contest will no longer travel! This just means that it will no longer be forced to follow a strict pattern of movement. The IYYF’s Executive Board is currently the core organizing team for the World YoYo Contest, and all three Executive Board Members (Ondra Sedivy, Hironori Mii, and Steve Brown [me!]) 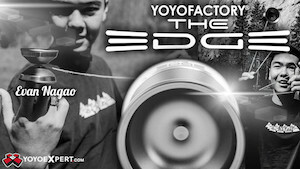 are constantly looking for new locations & venues for the World YoYo Contest. Breaking the cycle means that instead of trying to force the contest to fit into a certain region in a certain year, the IYYF can take advantage of any opportunities that arise to hold the contest in the best area with the best support for that year. This may mean that regions will double up in the future (two years back to back in Asia, but different countries) or it may mean that the IYYF simply changes the order to best use it’s resources (Americas – Asia – Europe), but what it definitely means is the contest is still moving, and the IYYF now has a little more freedom to make sure that the best possible option is utilized for that year. We are no longer accepting proposal documents for new locations in the same way that we have in the past. World YoYo Contest proposals in the past have assumed that the contest would be run entirely by a local team, with some logistical support from the IYYF, and the results have been mixed. External teams have done some great work and with oversight from the IYYF there has been some degree of consistency, but for an event as important as the World YoYo Contest, a higher degree of consistency must be maintained from one year to the next. And not just at the event itself, but also in the lead-up to the event, with registration deadlines, sponsorship proposals, ticket sales, etc. Moving the organization of the contest to a new group each year essentially means starting over each year for a lot of these things, and for the continuity of the contest it’s easier for one core organizing team to manage the main aspects of the event each year, regardless of location. But fresh ideas and new people are essential to the growth not just of the event but also of the IYYF, which brings us to…. If you are interested in running WYYC in your country, please contact us so we can discuss the possibilities; we will also ask serious applicants to join the current WYYC organizing team as a core member. Instead of people saying “Hey, my team can run Worlds, here’s our proposal” the new protocol will be to vet applicants based on their standing in the community and experience in event organizing, and then bring them into the organizing team for the upcoming World YoYo Contest. This will allow them to work side-by-side with experienced contest organizers and learn all the detail and procedures that need to be addressed for the World YoYo Contest, which will in turn make sure they have all the skills and perspective needed in order to take the lead on organizing the event in their home country. For example, the 2019 World YoYo Contest will be held again in Cleveland, Ohio and organized by Steve Brown and the 2020 World YoYo Contest will be held in Budapest, Hungary and organized by Vilmos Zoltan Kiss. In order to add continuity to the proceedings, Vilmos has joined the Cleveland organizing team to make sure that he has all the information and knowledge he needs in order to run a great event in Hungary, and the core team from the Cleveland event will also be assisting with the event in Hungary. After that, the core teams from both Cleveland and Budapest will assist with the 2021 World YoYo Contest in Japan. Moving forward this will not only guarantee a higher degree of consistency for each event, but will also bring in more organizers with new skills and perspectives that can help grow the IYYF and the World YoYo Contest. tl;dr – Worlds is gonna continue getting better, and keep moving around the world. All good. Check out full results & scoring breakdowns for the 2018 Ohio State YoYo Contest! Freestyle videos coming soon! Check out full results and scoring breakdowns for the 1A Division at the 2018 US National YoYo Contest! Congratulations to 2x US National YoYo Champion Evan Nagao! Check out full results and scoring breakdowns for the 5A Division of the 2018 US National YoYo Contest! Congratulations to 2018 US National YoYo Champion John Wolfe! Check out full results and scoring breakdowns from the 4A division of the 2018 US National YoYo Contest! Congratulations to 2018 US National YoYo Champion Ryan Connolly! Check out full results and scoring breakdowns from the 3A Division at the 2018 US National YoYo Contest! Congratulations to 6x US National YoYo Champion Alex Hattori!